Death Toll at Five for New York Helicopter Crash: Are Sightseeing Helicopters Safe? The tragic deaths of five passengers whose sightseeing helicopter plunged into New York’s East River on March 11, 2018, raise new issues about the safety of the U.S. air tourism industry, which has a reported crash rate more than 10 times higher than large commuter airlines. The crash — which occurred shortly after one passenger posted a happy Instagram video showing the moments aboard the chopper before it went into distress — is the third crash for tour operator Liberty Helicopters in the past 11 years. The pilot, who was the only survivor, reportedly told investigators that one of the passenger’s bags may have inadvertently hit the chopper’s emergency fuel shutoff button. The tragedy follows on the heels of a Feb. 10, 2018, sightseeing helicopter crash into a remote area of the Grand Canyon that also took the lives of five people. Three passengers died on the day of the Grand Canyon crash, and a couple on their honeymoon later died after being hospitalized. One passenger and the pilot of the EC-130 helicopter are in critical condition. The fiery Grand Canyon crash — which one witness described as the worst thing he ever saw — was the third deadly crash since 1999 for tour operator Papillon Grand Canyon Helicopters, which says on its website that it transports an estimated 600,000 passengers yearly. Across the United States, air tourism promises breathtaking views of everything from the New York City skyline, to the Hawaiian Islands, to the snowcapped mountains of Alaska, to the theme parks in Florida. From 2000 through 2010, air tour operators in the United States flew an estimated average of 512,113 hours annually with an average crash rate of 2.7 crashes per 100,000 flight hours, according to the 2014 study, “The U.S. Commercial Air Tour Industry: A Review of Aviation Safety Concerns.” About one-fourth of these crashes resulted in at least one fatality, with an average of 3.5 people dying in each fatal crash. The Federal Aviation Administration reports a total of 106 helicopter accidents in 2016, which includes air tourism, with 17 fatal accidents. In 2015, there were 121 accidents, of which 17 were fatal. In 2014, there were 138 accidents, of which 21 were fatal. In 2013, there were 146 total accidents, of which 30 were fatal. May 2017: A tour company helicopter crashed on a glacier near Juneau, Alaska, while returning from a dog mushing camp. Seven people, including the pilot, were onboard and sustained injuries ranging from “slammed fingers” to lacerations requiring stitches. February 2016: A sightseeing helicopter carrying five people crashed near Pearl Harbor, critically injuring a 16-year-old-passenger and sending two others to the hospital. Bystanders assisted rescue workers in bringing victims ashore. June 2015: A sightseeing plane crashed into a mountain northeast of Ketchikan, Alaska, killing eight passengers and the pilot. Federal investigators found that the pilot became disoriented in cloudy weather under pressure to return the passengers to their cruise ship before it departed. Two other tour companies declined to fly that day due to low-hanging clouds. November 2011: Four passengers — including a newlywed couple — died when a sightseeing helicopter slammed into a mountainside on the island of Molokai, in Hawaii. October 2011: A 40-year-old British tourist died when a sightseeing helicopter plummeted upside down into New York’s East River, trapping her inside. August 2009: Five Italian tourists died when their sightseeing helicopter collided in mid-air above New York’s Hudson River with a small plane and crashed into the water. In total, the crash took the lives of nine people, including a child who was a passenger aboard the plane. Just prior to the crash, an off-duty pilot employed by the tour operator noticed the plane and tried to alert his colleague by radio. Limited flight space also increases the risk of mid-air collisions in that many sightseeing helicopters are packed into a single location. 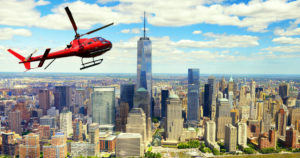 A case in point: The New York City Economic Development Corporation estimated that in 2014 there were more than 56,000 sightseeing helicopter trips hovering over the city for up to 10 hours each day, every day. Pilot distraction, which occurs when pilots act as tour guides and interact with passengers, can also impede safety, Vezina said. “The tour part or the speaking part of it should absolutely be second,” he said. Pilot experience is another factor that can contribute to a crash, Vezina said. Tour operators need to keep expenses low to remain competitive and generally hire less-experienced pilots who work for lower salaries, he said. If you decide to go on a helicopter tour, a little research might go a long way in minimizing your risk, Vezina said. Also, the National Transportation Safety Board website provides an Aviation Accident Database in which consumers can type in the name of a tour company and get information about accidents and other incidents related to safety.